Many people consider their animals to be like their children. It is not uncommon then to see some of these same people treat their animals better than they treat other humans. Likewise, they develop strong bonds with these animals, which tends to make these people attribute human traits and qualities to them. This results in many to adopt the belief that when it comes to matters of eternity, their animals will be treated like humans. What position do animals hold in comparison with humans? A popular movie in 1989 and the early 1990s was the movie, “All dogs go to Heaven.” The story line is of a dog named Charlie that was murdered while he is intoxicated at a Mardi Gras party (1)(2). After his murder, he found himself in heaven based on the policy that all dogs go to heaven. Charlie arranges by deception to return back to the living. When discovered, he receives a warning that because of his deception he will go to hell because of his actions after he dies again. When he returns back to life, through a series of misadventures, he gets revenge on his murderer, but dies in the process of saving a human girl. Because he gave his life for the girl, he is rewarded with being spared from hell and is allowed back into heaven. Without getting into all the theological considerations that this movie teaches children about heaven and hell, in order for this story line to work you must attribute human features and qualities to the dogs. While some may consider this to be a cute movie, it denies the reality of the position that animals hold as it compares with humans. In Genesis 1:24-25, the Bible tells us that on day six of creation God commanded the earth to bring forth living creatures on the land after “his kind.” If you contrast this with Genesis 1:26-27, you find that God commanded that man be made “in our image,” referring to the creation of man in the image of the Father, Son, and Holy Spirit of God. Furthermore, God created man in His own image as male and female. These two passages teach us that animals were not created in the image of God and that humans were not created in the image of animals. It is this truth that also gives us the answer to the position that animals hold as it compares with humans. Genesis 1:26-28 also teaches that God ordained man to have dominion over every living thing on the earth. Therefore, it is clear that animals hold a position below humans and are under human dominion. This directly contradicts the teaching of many that humans are nothing more than highly evolved animals. Likewise, teaching the same that humans are nothing more than animals denies the authority and dominion of God. 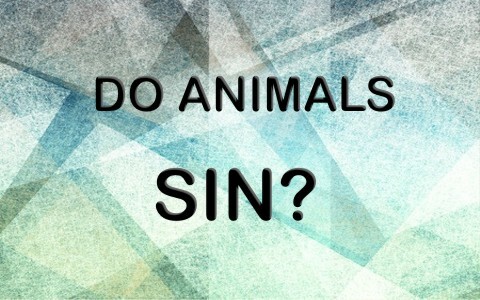 How does the position of humans and animals affect their ability to sin? It is easy to get sentimental and humanistic in consideration of an animal’s ability to sin. However, if sin is the transgression of the law and the law is our schoolmaster (Galatians 3:23-26) that teaches us what is sin, how can we honestly expect that animal would have the intelligence and ability to understand the law that teaches about sin? And, if an animal does not have the ability to understand the law, how can it be held accountable for sin? And after all, if human babies are not accountable for sin because of their inability to conceive the idea, certainly animals cannot be held accountable either. What guides an animal’s behavior? Psalms 32:9 confirms an animal’s lack of understanding and how humans control their behavior: “Be ye not as the horse, or as the mule, which have no understanding: whose mouth must be held in with bit and bridle, lest they come near unto thee.” Likewise, humans that reject God are compared to beasts that behave out of ignorance and instinct (Jude 1:10). Furthermore, these humans are also compared to animals in that they are made to be taken and destroyed (2 Peter 2:12). Therefore, an animal’s behavior is guided by instinct unless controlled by humans. How do the animals and humans differ spiritually? This is answered in Ecclesiastes 3:19-22, which teaches that humans and animals are the same when it comes to physically dying. This passage also teaches that spiritually unsaved humans are no different than animals. However, humans who are saved, recognize and embrace righteousness as defined by God are spiritually in a different position. At the moment of their death, the spirit of the saved human goes upward to God while the spirit of the beast goes downward to the earth. Animals were created by God to be different than humans in both the image of their creation and their position with one another. Animals do not have the ability to sin as defined by the Bible, because they do not have the ability or intellect to understand the law and a consequence of breaking the law. An animal’s behavior is guided by instinct unless controlled by humans. Animals and unsaved humans are no different in that their spirits go down to the ground at the moment of death, but saved humans differ in that their spirit goes upward to God at the moment of their death. Resources – Scripture quotations are from The Holy Bible, King James Version. (1) “All Dogs Go to Heaven” IMDb, http://www.imdb.com/title/tt0096787/, (2015). (2) “All Dogs Go to Heaven” Wikipedia, https://en.wikipedia.org/wiki/All_Dogs_Go_to_Heaven, (2015). You say that animals and unsaved people are no different in that both spirits go down to the ground at the moment of death. I’m just curious to what happens at the resurrection to both the animals and the humans? Are the unsaved humans the only ones being judged? A follow up question is do you think there is a difference between the soul and the spirit of man? If so, what is that difference? You quote Ecclesiastes 3 in your article. Later in Ecc 12:7 Solomon says, “Then shall the dust return to the earth as it was: and the spirit shall return unto God who gave it” KJV). How do you reconcile this idea to what you have mentioned regarding the spirit of the unsaved man? I’ve read and reread your article several times. Are you saying that unsaved humans, animals, and human babies’ spirits go down to the ground at the moment of death? Does “go down to the ground” mean going to Hell? Babies and other humans who have not reached the condition of accountability go to Heaven when they die (2 Samuel 12:22-23). Saved and unsaved humans have souls and are judged by God. But I think animals, insects, plants, etc are just here and when they die or are killed, they just cease to exist. I am very open to comments you may have on this as I never thought of animals having spirits, and yes, I did read Ecclesiastes 3:19-22. Again, to repeat my questions, are you saying that unsaved humans, animals, and human babies’ spirits go down to the ground at the moment of death? And does “go down to the ground” mean “go to Hell”? I do not mean to step in front of Dr Williams, but I understand your question. I asked the question about man’s soul vs his spirit for the very same reason. We must define these terms before a meaningful discussion can take place. Great resources there brother. Thanks Doc. Thanks for those links. I’m going to read them again as there was way too much important info for me to absorb in one reading, not to mention being sidetracked by googling and reading things mentioned in the articles like the info on http://clarencelarkincharts.com/. I truly appreciate your response. Thank you for sharing this, I enjoyed reading it. However, I disagree with your comment “This directly contradicts the teaching of many that humans are nothing more than highly evolved animals”. Firstly because it really doesn’t, having dominion over something isn’t the same as being above them in the same way that God is above us, but it’s more being in charge of them. God needed something to look after the Earth he had created and so he made man in his own image but it doesn’t specify how he made man. I think there is a real danger with the use of the word dominion that you are somehow making man the Gods of animals and that isn’t correct. Secondly, God did not give us any control over how that animal developed over time – that remained solely in His control. Just because we were given dominion over the animals, doesn’t mean to say that evolution didn’t happen nor that we weren’t produced from a common ancestor of the animals. We may have evolved from a common ancestor of apes, regulated by God so that we were created in His own image and then given the command to have dominion over the animals on the Earth. God gave us a task, He didn’t give us divine status. Also, when the theory of evolution was presented, many pastors at the time were delighted with it. They saw it as a wonderful theory that God not only creates animals but gives them the tools to self-regulate and adapt to their surroundings. Evolution is not an atheistic theory; nothing in science disproves the existence of God and it has never tried to. It should be noted that Darwin was a Christian! So to say that because man was put in charge of (has dominion over) the animals on Earth a) does not prove God intended for us to be vastly above animals (we are not Gods of animals) and b) does not disprove the theory of evolution. I would argue that this evidence is insufficient. Hello Mr. Crawford. I don’t know what the author would say but Jesus mentioned God creating them male and female and in the image of God (Gen 1:27) and not the amoeba after the amoeba kind and then they evolved into mankind. Adam and Eve were true, historical figures and existed by God’s hand and not over time or by chance but instantly. Jesus didn’t believe in evolution because He spoke of this existence, of Noah and his ark, and other such supernatural events that evolution cannot explain. Evolution has no answer for how life began other than placated theories, and as for “many pastors” delighting in this, quite the contrary was true. They saw it as a threat to God as the Creator. They knew the implications of God winding up the universe and letting it evolve is non-biblical and is contrary to the creation account and the six days He created them, resting on the seventh day. Also, I read the authors article and he is only saying what the Bible says and that is precisely that God gave dominion over the animals. Dominion and dominance are not the same things. Evolution cannot fit into the creation week. It remains a theory after 120 years and the Bible remains true for over 6,000 years…in the beginning, God created the heavens and the earth (Gen 1:1) and if man had to give names to the animals, that not only shows dominion over them but also that they were fully developed at the time and Adam didn’t have to wait around for the elephants to evolve. Genesis says God created them after “their own kind.” Thanks for your comment, but I don’t have enough faith to believe in evolution. Evolution has no answer for how life began other than placated theories, and as for “many pastors” delighting in this, quite the contrary was true. They saw it as a threat to God as the Creator. If the wages of sin is death but throught christ is everlasting life, then shouldnt animals live forever if they never sinned? In biblical times many lived well over thier hundreds so why dont animals? I see your point, but the Bible is silent on whether animals or pets will be resurrected to their owners. We just cannot say authoritatively from Scripture, so where Scripture is silent, so must we be. A germ is also sinless, as is tuberculousis, so just because something besides humans does not sin does not mean they have eternal life. There will be animals in the kingdom I believe, but our pets? Who knows but God.